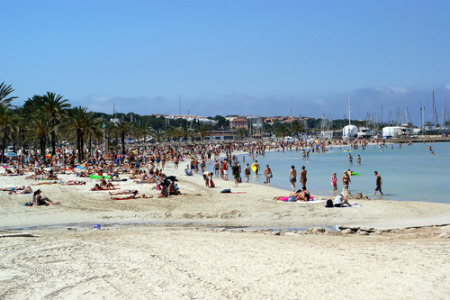 El Arenal holidays take you to a resort close to Palma on the south east coast of Majorca. It is a lively resort with a long stretch of sandy beach and a wide range of recreational facilities. Low cost airlines fly from most regional airports so travel to the island has never been cheaper. The holiday season lasts from April until the end of October with the mercury rising into the low thirties in the middle of summer. With a short flight and very short transfers, you can breakfast at home and be on the beach, basking in sunshine by lunch time. El Arenal has wide appeal as the long, sandy beach, interspersed with palms, is ideal for families with young children and the liveliness of the resort appeals to young singles. The beach slopes gently into the warm, clear sea, perfect for paddling and for young swimmers. A variety of water sports are available for the more energetic holidaymaker. El Arenal has accommodation catering for most budgets. Don't dimiss the all-inclusive option out of hand as it can help you remain within budget. This is especially true for those with children as constant snacking and unquenchable thirsts can quickly empty your wallet. A vast number of restaurants, bistros and bars provide for all tastes, even the most unadventurous palate that only wants familiar food. Likewise with shops. You can find all you need in the resort but for the ultimate shopping experience take the bus to the capital, Palma. There is nightlife to suit every mood. Although El Arenal has a slightly wild reputation where you can party through the night, there are many venues that suit family groups as well as providing romantic evenings for two. With plenty to occupy your days, your El Arenal holiday can be as active or as relaxed as you wish. Many water sports are provided and there is a huge water park that is enjoyed by children and adults alike. With its wide appeal, El Arenal holidays are in great demand. As a price comparison site, with almost three dozen travel companies competing for your booking, there are great bargains to be found. Our simple search facility, avoids the tedious task of trawling the internet and will find you the cheap El Arenal holiday that offers you the best value for money. All you have to do is ring the number, book your place, pack your bags, don your sun glasses, and off you go.